One of downtown Traverse City’s most historic and long-running businesses closed its doors on Front Street this week, bringing an 86-year run to an end. Petertyl Drug Company informed customers Monday it was going out of business, with the store’s windows papered over and the front doors locked shortly thereafter. According to multiple sources – including Petertyl and CVS Pharmacy employees – owner James Wolff is retiring after several decades in business and sold the store’s pharmacy business to CVS on West Front Street. Signs posted in Petertyl’s window this week directed customers to CVS for their pharmacy prescriptions, and the store’s business number now redirects to a recorded message welcoming customers to “CVS Pharmacy and the former Petertyl Drug.” A booth erected at the CVS store entrance this week also displays a sign welcoming Petertyl patients. Wolff could not be reached for comment. Petertyl Drug is one of a handful of companies – along with Votruba Leather Goods, Walters & Hemming, and Oleson’s Food Stores – that top the Chamber’s “seniority list" with continuous membership dating back to at least 1935. Store founder Milton Petertyl opened the original drug store in 1932 across Front Street from its current location. R.E. “Boots” Wolff – who started working at the drug store in 1953, according to a Chamber biography – purchased the business in 1968; James, his son, later took over. Luciani notes the Wolff family toughed it out downtown during multiple economic downturns, including decades when retail business was rapidly shifting to malls. 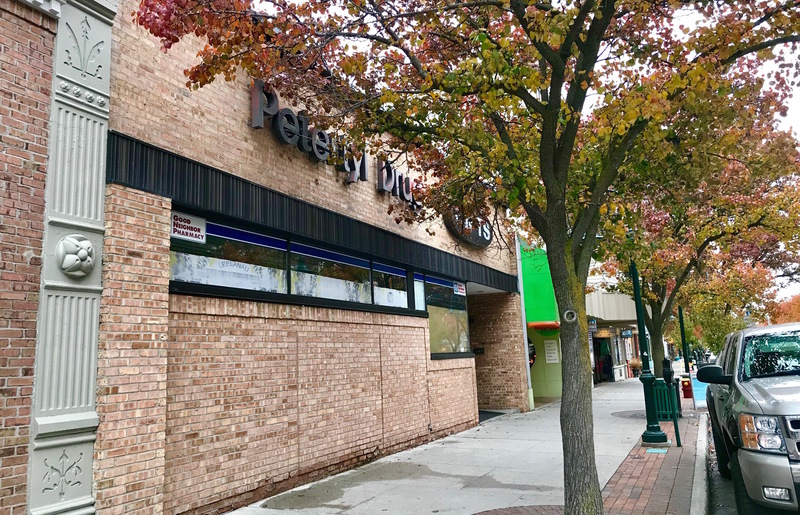 The abrupt closure of Petertyl opens up a rare storefront vacancy on one of the most trafficked blocks of Front Street – a highly visible location near the Front and Union Street intersection. According to building owner Mark Johnson – who has owned the building for almost five years and says he offered a lease extension to Wolff, but was declined – the space will be available starting January 1. Johnson says he is open to either selling the building or leasing it again, adding that if he continues to own it, he’ll make improvements to the front exterior. “One of the things I was going to do is take that brick façade off the front and replace it with glass, to open things up,” says Johnson. He says that in addition to the 5,444 square-foot main level space, there’s a usable parallel basement space underneath of the same size – offering almost 11,000 total square feet of real estate on Front Street. Johnson says he is fielding inquiries for the building now by email at mark@c21northland.com. Derenzy says she can’t think of another property comparable to Petertyl’s size or visibility available in downtown Traverse City. “That is a big space,” she says. Luciani agrees, adding that such a “valuable property” will require an owner or tenant “that will really have a strong business plan that could go in there and meet the market.” Derenzy concurs with Johnson that adding more windows to the front of the building would improve its visibility over the existing brick wall. She says the DDA is hopeful the space will continue to be used for retail in some capacity. “We would like to see that section of downtown be more retail-oriented, and with that amount of space, maybe there could be more activity or a mix of uses,” she says, suggesting that the building could potentially be shared among multiple tenants. “That space is helpful in getting people down Front Street and turning the corner to Union Street and going down into Old Town. It’s an important corner for us, and opening that up more will help."